Vintage gold bar brooch with bejeweled fly: Description by Adin Antique Jewelry. 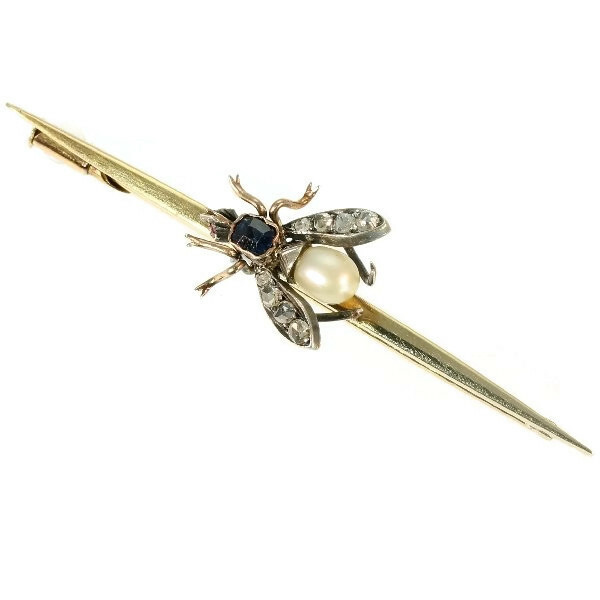 1930’s gold bar brooch with a bejeweled fly. The body of the fly is composed of a pearl and sapphire connected by a silver ring. The wings are silver encrusted with eight rose cut diamonds and for the eyes two rubies were used. Diamonds: Eight rose cut diamonds . We do not have the weight of the diamonds which is normal in our trade when it comes to rose cuts. Precious stones: One sapphire and two rubies for the eyes. Birthstones: Diamond is the birthstone (or month stone) for April, sapphire for September and ruby for July.